Turns out it’s not just hype that Kauai is the wettest place on earth. During our week here, we’ve consistently had heavy rains overnight. However, they usually end around 6AM. Not today. It’s 10:30AM, we’re supposed to be at the airport, and instead we’re in the Hanalei plaza. The bridge that lies between us and aircraft has been closed since 1AM, when the water level spiked to nine feet. 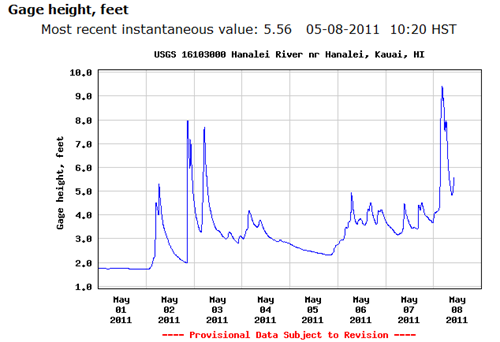 Statistically the Hanalei bridge reopens when the waters recede to about four and a half feet. We monitored the water level this morning from our B&B. Since conditions were looking better (water had receded to almost five feet) we attempted our airport run at 8:30AM. Unfortunately, the weather has not decided to cooperate, with the rains kicking back into high gear. The cop at the bridge told us “it will be at least a few hours…or possibly all day. I’m stuck here as well.” For now we’re rebooked on an afternoon flight, which buys us three more hours, but I’m dubious that we’ll be able to leave the north shore at all today.